It's a busy time of the year for the region's primary palliative care provider, with Hospice Dufferin putting the finishing touches to its 2019 fundraising season. Since its launch back in 1988, Hospice Dufferin has provided support and assistance to thousands of families living, or dealing with, a life-changing diagnosis. The organization offers a wide-variety of programming and support services, available to individuals at their home, long-term care facilities, hospitals, retirement homes and at Hospice Dufferin's community hubs in Orangeville and Shelburne. In its 2017/2018 year, Hospice Dufferin supported 435 clients across the region through its palliative visiting, bereavement and anticipatory grief and various wellness programs. In total, the organization's two regional centres recorded 1,806 visits in the fiscal year – a marked increase from the previous 12 months. With the number of individuals reaching out to Hospice Dufferin for assistance on the rise, the organization is ramping up its fundraising efforts as we head into Spring. With a budget of approximately $230,000 this year, Hospice Dufferin Board Chair Dan LaCute notes the local non-profit will have to raise in the region of $60,000 to meet the needs of the community in 2019. He's hoping a huge chunk of that will come from a pair of fundraisers running on back to back weekends at the end of April and beginning of May. The 3rd annual Hope Through Harmonies is scheduled to take place at Black Wolf Smokehouse on April 27, while the 11th annual Hike for Hospice will run on May 5 at Monora Park. Last year's milestone Hike raised more than $15,000 for Hospice Dufferin. Mr. LaCute says this year's event will run much in the same fashion, with one kilometre, three kilometre and five kilometre routes open to the public. In an attempt to make the Hike more of a family-friendly event, there will also be “several children's activities”, including face painting, on offer before and after the event, with a barbecue also planned. Ms. Riedler notes there will also be a “something a little different” for those in attendance to participate in this year. Now three years into her own personal journey with Hospice Dufferin, Sara Rose is excited to bring her musical fundraiser back again in 2019. Having first joined the organization in 2016 on a student internship, Ms. Rose has gone on to become one of the local palliative care provider's most ardent supporters. Raising a shade over $4,000 through last year's sold-out Hope Through Harmonies, Sara is hoping to see a repeat performance on April 27. A talented local musician in her own right, Sara will share the stage at Black Wolf Smokehouse with the popular Campfire Poets. When asked what it was that inspired her to continue working with Hospice Dufferin beyond the terms of her college placement, Sara said it is a “special organization” that makes a difference in so many lives across our community. Tickets for the 3rd annual Hope Through Harmonies can be purchased at both the Black Wolf Smokehouse and Hospice Dufferin's Orangeville office, located inside the Edelbrock Centre at 30 Centre Street. 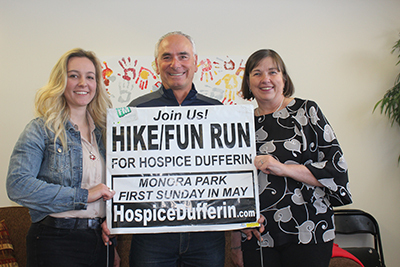 For more information on the 11th annual Hike for Hospice, including details on how to register, visit www.hospicedufferin.com.